It’s time to say final goodbye to your favourite show Saraswatichandra on Star Plus. 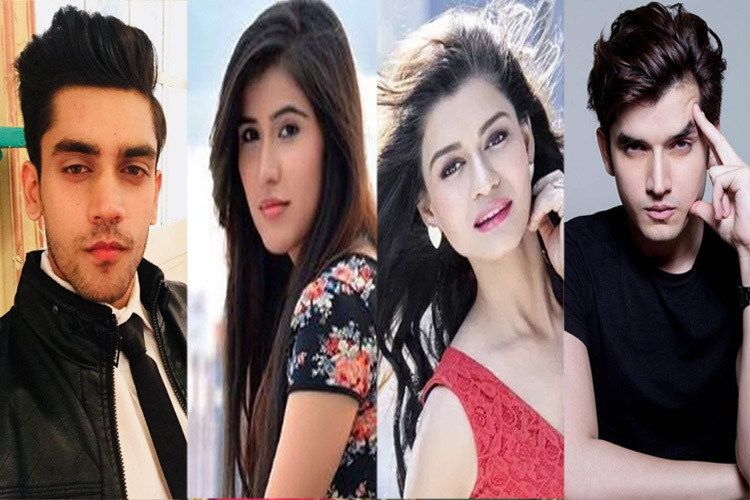 The show by Sphereorigins will air its last episode on 20 September and Tellychakkar.com got the information that the cast and crew are shooting for the last episode today. Firstly, let us tell you how the show will end. No points for guessing, that it will be a happy ending, but there’s a happier point also. Saras and Kumud played by the talented Gautam Rode and Jennifer Wingett will be shown becoming parents to a cuddly baby girl. That’s quite a sweet note to end. The show’s leading lady Jennifer remained unavailable to comment. Star Plus has a line-up of shows waiting in the wings to fly high. However, the channel does not have vacant slots to fit in their promising new line-up. Hence, there is a need to axe existing shows. After Meri Bhabhi was compensated for the launch of the big-ticket show from the Cinevistaas banner Ek Hasina Thi, it seems to be the turn of Sphere Origins’ Saraswatichandra to get the axe next. For the uninitiated, Saraswatichandra was helmed by Sanjay Leela Bhansali when it started. However, the ace producer’s efforts did not bring in numbers, and that is when Sphere Origins took over. Though the show has been popular, it has never been a major TRP-getter for the channel. It has done consistently well, but there is a need for newer programming to branch in. Nandita Mehra and Bhairavi Raichura’s (24 Frames) show on the international series Missing is tentatively slated to replace Saraswatichandra. But again, that might see a change. Other shows that are in the pipeline happen to be Miditech’s aviation based show Airlines, and Suzana Ghai and Hemant Ruprell, Ranjeet Thakur’s (Panorama Entertainment) upcoming show Ek Ladki Suhani Si. We tried calling Producer Sunjoy Wadhwa, and dropped a text message too, but did not receive any response till the time of filing the story. The marriage of Saras (Gauatm Rode) and Kumud (Jennifer Winget) in Star Plus’ Saraswatichandra (Sphere Origins) seems to have been jinxed with the couple finding themselves separated every time they are about to come together. As viewers have already seen that the wedding preparation of the two has been going in full force and the day will finally arrive when Saras will come to the gate of Kumud’s house with a lavish baraat. And the blushing bride Kumud will be all eager to get betrothed to the love of her life. But their dreams will be shattered with the entry of the cops. If you are wondering why the cops will be there for, here are the details. Kumud who had filed for a divorce from her first husband Pramad (Aanshul Trivedi) will find herself at the receiving end when cops and lawyers will come up to inform that this marriage will be against the law since her divorce has not being cleared by the Court. Although the family will try to make the cops understand, they will not budge from their stance. Well if you are feeling sorry for the couple, let us share some happy news for you all. A close source on the sets informed us that after this initial glitch, the couple will manage to get married. And as they say, that love that comes from the heart, is the real love, so eventually the love birds will unite leaving behind all their troubles and distresses. So stay tuned to enjoy the marriage of Saras and Kumud. We called up Gautam but he remained unavailable to comment. After a lot of challenges and heart pangs the Love God will finally bestow his blessings on the lovely couple Saras (Gautam Rode) and Kumud (Jennifer Wingett) on Star Plus’ Saraswatichandra (Sphere Origins). This made for each other jodi on this popular show has faced the wrath of ill luck throughout their life, by not getting a chance to unite. But now viewers will get a chance to rejoice as the couple will gear up to take the holy nuptial vows after getting approval from the family and especially after Kusum (Shiny Doshi) realising her mistake. As viewers already know, Kumud’s sister Kusum also fell in love with Saras thus bringing in a lot of troubles for the estranged couple (Saras and Kumud). And when Kusum got married to Saras’ brother Danny (Varun Kapoor) all hell broke loose after Kumud was blamed of spoiling Kusum’s life by getting her married to Danny. And now that the wedding is fixed, the viewers will also get a chance to see the couple spend some quality time and indulge in some romantic getaways. The passion and closeness that has been missing from the show will soon burn the TV screen. A superb treat for the fans for sure! We tried reaching Gautam but he remained unavailable to comment. The never ending saga of love and separation never seems to end on ‘Saraswatichandra’. Right from the emotional turmoil, which Saras faced at the start of their relationship, to the point when he faced regret and remorse for pushing Kumud in a wrong matrimonial choice, the quantum of pains have been more for him that gains. The same can also be said about Kumud, who had to bear the angst of not marrying Saras and then marry someone, who was more of a sadistic monster, wreaking her life and dignity at every walk of life. Pramad, Kumud’s husband had made Kumud’s life hell, right from the start. From the point of walking hand in hand with his girlfriend ‘Kalika’, harassing Kumud’s dignity, ruining her life, to the point of almost killing her, Pramad has not barred from any form of cunningness and torture towards his wife. However, with Saras around, Kumud felt brave. With her family’s support, she felt she could take on all this with ease, without flinching a bit. It was her family’s support and Saras’s love towards her, that Kumud had left Pramad behind and started to live her life once again. Little did she know that her happiness was short lived as Pramad once again was back in form, giving her pains. In yesterday’s episode, we watched how Pramad refused to give her divorce, stating his desire to live with her for the rest of her diseased life. He was posed to have life threatening disease, because of which he wanted to make amends to Kumud and give her happiness in his remaining life. Meanwhile, Saras had made all arrangement of marrying Kumud, with due permission from Badimaa and Vidyachatur, but he was in for shock to see Pramad at her home. Maybe the storyline will drag a little longer and create once again the pain and separation between the two eternal lovers, to make the chemistry as crackling as possible. The makers should not forget that the audience has been tested a lot like Kumud and Saras’s love. They have been holding patience to see them unite from a long time, but incessant twists and turns have spoiled their expectations every now and then. This time’s twist could not have been worse. With Pramad and Kalika now once again living together under the same roof, that too with Kumud and Saras around, are all to create more problems for the couple and their family. With Kalika knowing about Danny’s feelings towards Kusum, who knows she might soon create a huge furor. Plus news about Kumud, getting to know about her sister’s feelings towards Saras is also going to be a nerve testing episode! With innumerous twists and turns, all happening under one roof, it’s difficult to imagine how audience will not pay attention, to this epic love saga, despite futile attempts of re-union. Maybe these twists and turns will make the drama interesting and once again give the audience its regular dose of some magical moments between Saras and Kumud? “Over all I enjoyed the process of creating such a made-for TV concept. I thoroughly enjoyed the give and take with the channel on creative calls. It was interesting to understand what makes a show hit on the ratings game. We try to decipher the elements of why a show which is number one in the US is number six or number 8 in India (we assume he is talking about 24),” he said. In closing Sanjay said he would not prefer to do any more TV projects at the moment. There is no room for complacency when it comes to the drama element in Star Plus’ popular show Saraswatichandra, produced by Sphere Origins. As per our earlier report, Kumud (Jennifer Winget) has suffered a major accident. But all’s well as she will get back to her senses and recover on time. However, Saras (Gautam Rode) will have paid a heavy price before she is back to her sense, and has to leave her for her to get well - something similar to the story line of SRK-Katrina starrer Jab Tak Hai Jaan. However, the vow is broken when Kumud will make Saras realize that they are made for each other and have got a second chance to get together. Viewers will then see thunderous romance between Saras and Kumud post which they head home, only to receive a cold shoulder from Kusum (Shiny Doshi) who is madly in love with Saras. On the other hand, Saras will meet Pramad (Aanshul Trivedi) and get to know that he was the one who was the cause of Kumud’s accident. Learning this, Saras will bash him up. Pramad will then inform him that he is severely ill and wants Kumud to know of it. Saras will promise to tell her, but when home he will not be able to tell Kumud the truth. In the meantime Pramad will appear at Kumud’s house and apologise to her of all his ill doings, but she will ask him to leave her house. As he will be about to leave, Pramad will meet Saras and will taunt him of not telling Kumud of his illness. This will further make Saras guilty. Will Kumud get to know of Pramad’s illness? We tried getting in touch Gautam but he remained unavailable for comment. Gear up to see how these new twists take the show forward. With Diwali gone, the lights will flicker once again in the life of Kumud (Jennifer Winget) and Saras (Gautam Rode) as Kumud faces a life threatening moment and more worries in Star Plus’ Saraswatichandra (Sphere Origins). In the coming episode the family will be seen rejoicing the freedom of Kumud as her divorce from Pramad (Aanshul Trivedi) gets through. And suddenly the family will be shattered when Kumud’s cousin Yash (Surya Kanth) will come home with his newly married wife Kalika (Soni Singh). With this troublemaker stepping in the house, Kumud will feel guilty of the same. She will also get into a confrontation with Kalika where she will realise that she is still in love with Saras and would want a second chance with him. She will try to convey her feelings to Saras but he will not give an ear to her. With her family in trouble, and feeling dejected by Saras’ hard words, Kumud will be walking on the road all lost when suddenly a car will hit her. Saras will reach the spot in time and, seeing her in a pool of blood, will rush her to a nearby hospital. “The doctors will inform him that since she has lost a lot of blood, saving her would be really difficult. She will be requiring blood from a ‘O’ negative donor, but no one in the family seem to be having the same blood group,” adds the source. The family will be at a loss with the specific blood group not being unavailable also in the blood bank. As Saras feels guilty of Kumud’s condition, Kalika will inform that she has the matching blood group. But will she agree on donating blood to save Kumud? How will Saras manage to save her? Saraswatichandra garnered it to Top 10 fiction shows! Slowly but steadily Star Plus’ family show Saraswatichandra has generated a good place among the daily soap buffs, thanks to the captivating storyline and commendable performances by Gautam Rode aka Saras, Jennifer Winget aka Kumud among others. The show was begun eight month ago with much pomp and glory as filmmaker Sanjay Leela Bhansali took the initial assignments that later on shifted to a new production house citing content issues between former producer and Star Plus. Now, latest has that despite a slow start garnering low ratings for a long time, the show has now made it to the Top 10 list of fiction shows. As per the weekend’s ratings, Saraswatichandra make it to the top shows. The rating of the top shows is like Diya Aur Baati Hum remains in the top, followed by Jodha Akbar, Taarak Mehta Ka Oolta Chashma, Saath Nibhaana Saathiya, Pyaar Ka Dard, Yeh Rishta Kya Kehlata Hai, Saraswatichandra, Balika Vadhu, Qubool Hai and Mahabharat. We must says the plot in which Pramad, Kumud’s wicked husband has worked out in its favour. In the ongoing track, Kumud is seeking divorce from Pramad with the help of Saras, while the Pramad is making hiccups in their way and denying signing on the divorce paper. Let’s see what makers have next to bring for the audience? Will Kumud get divorce from Pramad in Saraswatichandra? It’s time to celebrate love of Saras (Gautam Rode) and Kumud (Jennifer Winget) in Saraswatichandra as Kumud is finally getting divorce from her wicked husband Pramad (Aanshul Trivedi). Yes, after the acquisition of the land plot comes to an end, Pramad will accept his defeat and sign on the papers of divorce. According to the sources Kumud along with Saras will be able to bring a larger audience to their site and finally come out triumphant in the challenge. And in accordance, Pramad will sign the divorce papers freeing Kumud from their troubled relationship. “Kalika (Soni Singh), who will get the divorce papers to Kumud on behalf of Pramad, will warn her that they (Pramad and Kalika) will not let go off their enemies that easily. Also Pramad will be seen paying the goons to attack and kill Kumud,” said sources. Saras feels top of the world that the school has been named on his mother’s name. He will get extremely emotional seeing this and will try to convey his thoughts to Kumud. Will Kumud-Saras finally get together? And with Pramad planning to attack Kumud, what lies in the future for these three? Kumud to file police complaint against Pramad in Saraswatichandra! With a high-octane action packed episode where Pramad was hell-bent to kill Kumud and Saras, the Star Plus’ show Saraswatichandra is getting very interesting. In the last episode, Pramad gets back home with fake wounds and says it was done by Saras. He informs his family member that Kumud has ran away with her lover Saras and when he tried to stop her Saras harmed him badly. While other side, truth is that he has fired a bullet to Saras’s hand. Kumud somehow manages to save his life and both manage to stay safe. Now in coming episode Saras and Kumud will safely return home inform everyone about Pramad’s reality. At that moment Pramad’s family will also come there and an altercation will happen between them in an attempt to find out the truth. “Pramad on seeing himself getting stuck, will gather the village people and start defaming Kumud in front of them. Everyone will side with him and tell Kumud to prove her purity and innocence by giving an Agni Pariksha. But she will deny it saying that she does not want to prove herself for a person like Pramad who wanted to kill her,” said sources. Instead of getting feared from Pramad, she will announce that she will file a police complaint against him. All villagers will be seen taking aback but Kumud’s family will come in her support. Police comes and arrest Pramad but his mother will ask for forgiveness and request Kumud to take back her case. Kumud will agree on the condition that she gets a quick divorce from him and can live a life of freedom. Kumud’s family along with Saras will go to Pramad’s house to get the divorce paper signed, but to their surprise Pramad will blatantly refuse to do so, enraging Saras. Pramad attempts to kill Kumud in Saraswatichandra! Sphere Origins production show Saraswatichandra on Star Plus is currently going through a lot ups and down keeping the interest of the audience intact and now soon there will be some unexpected drama to galore. So far audience could notice how Pramad (Aanshul Trivedi) has been acting like a gentleman and trying to woo everyone in Kumud’s (Jennifer Winget) house. In the last episode Kalika tries to kill Kumud and was caught red-handed by Saras (Gautam Rode). In an attempt to save herself she blurts out the truth about Saras and Kumud in front of everyone. But, Pramad comes in support of Kumud and slaps Kalika for her deeds. Pramad to the shock of the family understands the situation and also support his wife’s love. He takes sindoor and asks Saras to fill Kumud’s maang and get back together. Everyone was surprised by his gesture but Kumud asks Pramad to fill her maang and they get remarried and promise to start a new life altogether. They agree to give this relationship a fair chance and make it work at any cost. But soon in the coming episodes tables will turn and audience will get to know that it was Pramad and Kalika’s plan to expose Saras-Kumud in front of the family. Now Pramad will pretend innocence before Kumud and act as a perfect husband. He will also tell Kumud that Saras still loves her and that is why he doesn’t want their marriage to work. “Saras will try to explain things to Kumud and tell her about Pramad’s true intentions, but she will be infuriated. But feeling guilty she will ask him to leave the house forever and leave her with her husband, and a dejected Saras will quietly leave,” said sources. On the other side Pramad’s reality comes out when he and Kalika were seen planning to send Kumud out of the house and kill her and put the blame on Saras. Saraswatichandra set for a major twist! Star Plus magnum opus Saraswatichandra has consistently been witnessing some unexpected twists and turns. Last night’s episode was one from the many high-end dramatic episodes in which Pramad was spotted as a gentleman. Pramad is currently at Kumud’s (Jennifer Winget) home to celebrate Navratre, along with Saras (Gautam Rode). He is behaving extra nice to everyone, which Saras finds weird to believe. Pramad praises Saras in front of everyone and says he wanted to do something for him. He asks Vidyachatur to give his daughter Kusum’s (Shiny Doshi) hand for Saras aka Naveen. As everyone looks stunned at him, Saras understands that it is a gimmick and he agrees for the wedding. Soon, it would be seen that lawyers will suddenly come to their house informing that they just have seven days before the house goes up for auction. Saras and Danny (Varun Kapoor) sensing the troubles will plan to help the family. Will Kumud be able to tell the truth to Pramad? And will Saras and Kusum get married? Only time will tell. Saras-Kumud joins hand to throw Kalika out of house in Saraswatichandra! The tempting drama on Star Plus’ Saraswatichandra is set to witness another twist in the tale soon. Recently it has showcased how Pramad (Aanshul Trivedi) forced Kumud (Jennifer Winget) to consummate with him, and in the coming episode he will forcibly make her drink alcohol. Seeing Kumud in such a hurting state Saras will get upset and feel that Pramad is damaged beyond repair. According to the sources, the entire fasting drama around the strained relationship of the husband and wife will take hype during Teej sequence. “Pramad’s mother Saubhagyadevi (Pratichee Mishra) will ask Kumud to fast for Pramad, but Kumud will decide that she will do so only if he accepts her as his wife. She will write a letter to her mother-in-law but Kalika (Soni Singh) will play her tricks again to let Kumud down. Kalika’s plotting will not get unseen by Saras who will decide to help Kumud on the same,” reported sources. It is also added by sources that Kumud will go to bar to get Pramad back who will be once again busy drinking. “Unknowing to her real deeds, Saubhagyavati will also send Kalika along with Kumud who will in turn poison Pramad once again against Kumud. Kumud will threaten Pramad in front of his friends and bring him back forcibly. Once home he will try to avenge his insult by hurting Kumud again. A distraught Kumud will run away from the room only to bump into Saras,” informed sources. Will Kumud give up on Pramad's advances in Saraswatichandra? New production house, Sphere Origins has taken the task of making Saraswatichandra more captivating and is currently gearing up with some high end dramatic sequences to rush back into the TRP race. The disheartening story of Kumud (Jennifer Winget) will see a new twist when his spoiled husband Pramad (Aanshul Trivedi) will try to consummate their marriage, intentionally and forcibly. According to the sources, the show will witness some intense drama during Janamasthami celebration where Kumud will try to convince Pramad to join his family in the Pooja. “Kumud will challenge Pramad that if he continues consuming alcohol, she will not break her fast. When Saras (Gautam Rode) will get to know about it, he will hide the bottle just to get Kumud out of the situation. After Pramad finds the bottle, he will go ahead and shove food in Kumud’s mouth declaring himself as the winner,” said sources. If this is not enough, drama will roll high when Kalika (Soni Singh) informs Pramad that Kumud has some connection with Naveen (Saras). “Pramad will confront Kumud and accuse her of having an affair with Naveen and call her characterless. Though the family will be shocked at this revelation, Kumud’s sister will come up and take care of the situation by proclaiming that it was she who was in a relationship with Naveen,” added the sources. But, this will not go well with Pramad and he will break all levels of disbelief when he will ask Kumud to consummate with him and take their relationship to another level. Will Saras let the injustice happen to Kumud? How Kumud will convince her husband and prove her innocence?